A new tournament is on the horizon, one that is set to challenge the supremacy of Wijk aan Zee, Linares and Dortmund. 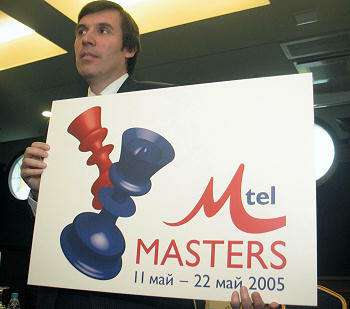 The M-Tel Masters Super Tournament is part of the ten-year anniversary of the Bulgarian mobile phone company Mobiltel, and is set to take place every year. The last column shows their world ranking (Judit Polgar was not on the FIDE world ranking list due to a one-year maternity leave from the game). The tournament reaches the 20th category according to FIDE and, with an Elo average of 2744 will be the strongest this year world-wide. An overall winner of the tournament will be found by tie-break if there is a draw at the top. The event is being staged by “Mobiltel” and “Kaissa Chess Management”, an agency run by GM Silvio Danailov, manager of Bulgaria's top GM Veselin Topalov. It will be staged in the five-star Grand Hotel, located in the middle of Sofia, in walking distance of the National Theatre, Art Gallery, Concert Hall, Opera House and all the famous landmarks of the capitol of Bulgaria. On the rest day Veselin Topalov will give a simultaneous exhibition for chess fans at the garden in front of the National Theater, on ten marble chess tables set up by Mobiltel for the garden. this is the second big chess event sponsored by Mobiltel. In February last year the mobile operator organized a TV exhibition match between the rapid chess World Champion Viswanathan Anand and Veselin Topalov. A draw by mutual agreement between the players is forbidden. A player can claim the draw only in case of perpetual check, threefold repetition and if the position is a theoretical draw. The draw offer is made to the arbiter, who is the only person who can decide the outcome of the game. The arbiter will be advised by a strong Grandmaster. The chief arbiter of the event is Joaquin Espejo (Spain), deputy arbiters are Boris Postovski (USA) and Panaqiotis Nikolopoulos (Greece). The GM advisor is Zurab Azmaiparashvili (Georgia), FIDE Vice President.